Three more "Greece is..." magazines are out! Our blessed Goddess Aphrodite intrigues me. She is a Goddess of both love and war, of friendship and hate, of companionship and jealousy. She is one of the Goddesses with the widest range of domains and influence in our world and She is Goddess that touches us personally. She doesn't control the weather or the sea, She controls us directly. Aphrodite's cult was very popular in ancient Hellas with numerous shrines and temples throughout the land. Her main cult centres within Hellas were the city of Corinth, and the island of Cytherea off the coast of Lakedaimonia. Beyond Hellas the island of Cyprus was famed for its Mystery cult of the goddess. Aphrodite was also worshipped with private rituals and prayers. One of the aspects of Aprodite's worship that has always fascinated me is Her connection to doves. Aphrodite's jewel-encrusted, golden chariot was drawn through the sky by a team of doves. 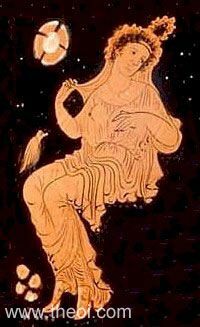 The Syrian Aphrodite Astarte was said to have been hatched from an egg nursed by doves. In Hellenic art, Aphrodite's doves symbolize the pure, spiritual aspect of love, rather than physical love. Aphrodite's primary festival, the Aphrodesia, also had a very special place for doves. An inscription on a stele of Hymettian marble found near the Beulé Gate at the site of the aedicula on the south-west slope of the Acropolis, dated between 287 and 283 BC, records that at the time of the procession of Aphrodite Pandemos, Kallias, son of Lysimachos of the deme of Hermai, was to provide funds for the purification of the temple and the altar with the blood of a dove, for giving a coat of pitch to the roof, for the washing of the statues, and for a purple cloak for the amount of two drachmas. considered oracular birds; the oracle at Dodona was considered the oldest in Hellas, even if it was later replaced in importance by the oracle of Apollon at Delphi. According to Herodotos, in his Histories, the oracle was founded when two black doves flew from Thebes in Egypt; one dove settled in Libya to found the sanctuary of Zeus Ammon, and the other settled in an oak tree at Dodona, proclaiming a sanctuary to Zeus be built there. Doves also take nectar and ambrosia to the Gods on Olymos. Doves are not unique to Aphrodite's worship, but it strikes me that they are as diverse as Her. They are also very "personal" animals--domesticated, bringing food and drink to the Gods, coming home to their mate. They fit Her, and I have no trouble picturing them as Her birds.